Each poem is ripe with stunning imagery, like in “January Towns” (page 38-9), “. . . Sometimes the light/above the clouds winks out a full-size replica/of our lives. We are crystals of frozen water;//” Not only is life transient in nature as we move from one moment to the next, but it is also frozen in time for us to review at anytime in our memories. A bit of us, as we were is frozen, captured. We seek to capture those moments not only in our minds, but in photos and videos, and in some moments we see ourselves in the past and wonder who those people are. From “Poem With/out a Face” (page 16-7), “Desire is serendipity,/is pity, is blind,is danger,is not/obligation, is poking the most/alien thing with a stick to see/if it stirs and clings, the way/” Some memories are clearer than others, which is true even of those moments in our lives that we thought we’d remember forever through a clear, clean lens, only to find the lens is murky and obscured. In the second section, “Ideal Cities,” Meitner’s poems are not about a utopia in the true sense of the word, like a world without crime, etc., but they are about the communities that reside in each city, with their diversity, quirkiness, and pain. There are a great deal of images in these poems that pay homage to the sounds of cities, from construction equipment to the silence of social networking. This section is smaller than the first, but tackles tougher subjects like the Holocaust, though both sections glance at pregnancy and birth. From “Elegy With Construction Sounds, Water, Fish” (page 75-7), “There is music, and there is music./There is water from a plastic pitcher/hitting slate pavers, silenced by skin./There are valleys with houses tucked/into them and something trilling/” From birth to death and city to the suburbs, Meitner’s focus is on the journey that life takes, even its most devastating parts. Meitner’s poetry has a quickness that illustrates the transient nature of the modern world, and her poems beg the question of whether modernity is ideal or whether suburbia is ideal. Readers will examine each of these poems and discover that the answer to that question lies within themselves. The poet endorses neither one nor the other, but she does examine the old world versus the new world. Ideal Cities by Erika Meitner is an enigmatic collection with moments on clarity and stunning imagery that highlights the transient nature of the modern world whether you live in the city or in suburbia. Also check out the poem from this collection that was under discussion in the 109th Virtual Poetry Circle. She is currently an Assistant Professor of English at Virginia Tech, where she teaches in the MFA program, and is also simultaneously completing her doctorate in Religious Studies at the University of Virginia, where she was the Morgenstern Fellow in Jewish Studies. This is my 21st book for the Fearless Poetry Exploration Reading Challenge. This is my 43rd book for the 2011 New Authors Reading Challenge. 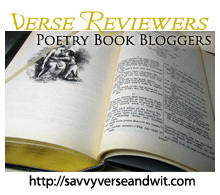 Welcome to the 109th Virtual Poetry Circle!